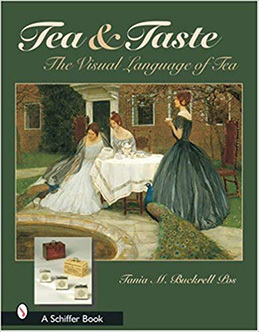 Afternoon tea has always been a time-honored and cherished ritual in my family, so I loved reading, Tea & Taste, The Visual Language of Tea, by Tania M. Buckrell Pos, published by Schiffer Publishing, Ltd. The book is beautifully written and is a treasure of information into the history and etiquette of tea along with stunning photographs, gorgeous artwork, and even recipes to stimulate your appetite. The book makes a perfect gift for your favorite tea afficionado. Tania M. Buckrell Pos' book deftly provides readers with insight into the intriguing world of tea and its many customs. The book delves into: Tea History, The Decorative Art of Tea, The Fine Art of Tea, and Tea Miscellany, which provides helpful information on how to properly prepare tea, goes into the art of tea etiquette, has a section on specially designed tea furniture, includes a glossary of various teas, and even provides historic traditional recipes for tea cakes, scones, crumpets, biscuits, sandwiches, and more, to enchant your guests at your next tea party. 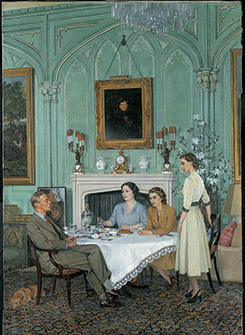 The book also goes into length about the distinguishing factors of traditional teas including At Home, Bridal Tea, Champagne Tea, Cream Tea, Formal Afternoon Tea (traditionally served at 4:00 pm), High Tea (traditionally served at 6:00 pm and serves as an evening meal), Little Tea, Nursery Tea, Picnic Tea, Summer Winter Teas, and Tea Cup Tea. Equally interesting is the information on tea equipment, which discusses the storage of tea in specially designed tea chests and tea cannisters, various types and shapes of traditional, whimsical, and modern teapots made from sterling silver, porcelain, and pottery, beautiful teacups made from bone china, porcelain, and pottery, exquisite tea linens, special spoons, tea infusers, sugar tongs, sugar nibs, and also discusses tea furniture (i.e. specially designed tea tables), and so much more. 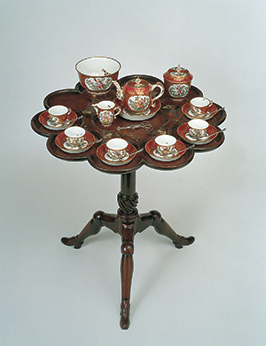 A stunning example of a tea table is shown in the photograph below, which is described in the book as "A George II mahogany tilt-top, ten-lobed tripod tea table inlaid with brass and mother-of-pearl, probably made by Frederick Hintz, 1737-98. The clever raised scalloped edge not only protected valuable porcelain but also provided a designated recess for individual teacups and a central area for serving pieces." The book concludes with information on Traditional Tea Merchants in Britain and Venues for Afternoon Tea in Britain, providing the reader with everything needed for aperfect tea. Long live the art of tea thanks to Tania M. Buckrell Pos' Tea & Taste, The Visual Language of Tea. Tea & Taste, The Visual Language of Tea, by Tania M. Buckrell Pos is published by Schiffer Publishing, Ltd. and is available as a hardcover. ISBN: 978-0-7643-1959-0, $35.00. The book is available in bookstores and online, including: Schiffer Books. Follow Luxury Experience on Facebook at www.Facebook.com/LuxuryExperienceto see photos and videos. © November 2018.Luxury Experience. www.LuxuryExperience.com. All rights reserved.